Maintaining a social justice blog entails writing about a lot of heavy, painful topics on a regular basis. So it’s nice to acknowledge positive progress from time to time, even if the victories are small. Here’s some good news for trans and non-binary* people regarding “singular they” and all-gender restrooms. 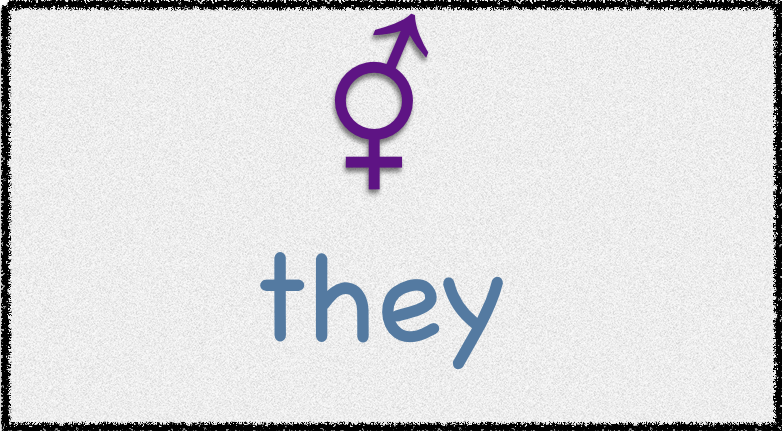 Last week, “singular they” was named the “Word of the Year” by the American Dialect Society. I’m often cynical about these kinds of announcements, but this is a positive development, as it will bring more attention to the growing acceptance of this preferred pronoun for (some) non-binary people (including myself). Singular they has been in standard usage since Shakespeare’s time, but telling people that hasn’t stopped them from insisting that it’s not grammatical to use when speaking about a single known person. Hopefully these people will eventually stop complaining and start accepting our choice of pronouns. This week, the Transgender Law Center and San Francisco Board of Supervisors announced legislation to require that city businesses and buildings designate all single-stall restrooms as all-gender. This development is long overdue. Having gendered signs on single-occupancy restrooms makes absolutely no sense. I’ve written frequently about the harassment trans people face when using gendered restrooms, even in places like SF where we already have the right to use facilities corresponding with our gender identities. And many of us non-binary people misgender ourselves whenever we go into either a “Mens” or “Womens” restroom. Opening up access will improve safety and quality of life for trans and non-binary people. Other cities that have enacted similar legislation include Washington D.C., Philadelphia, Austin, West Hollywood, Berkeley, and New York. I hope that more cities soon follow suit, and I look forward to a time when gender policing becomes a thing of the past. * I state these terms separately because not all non-binary people identify as trans. Great post with some heartening news. Your link to the writing about standard usage is greatly appreciated. I would urge everyone to read and share it with others. The definition given for the snazzy word “Grammaticaster” is superlative. Thank you.